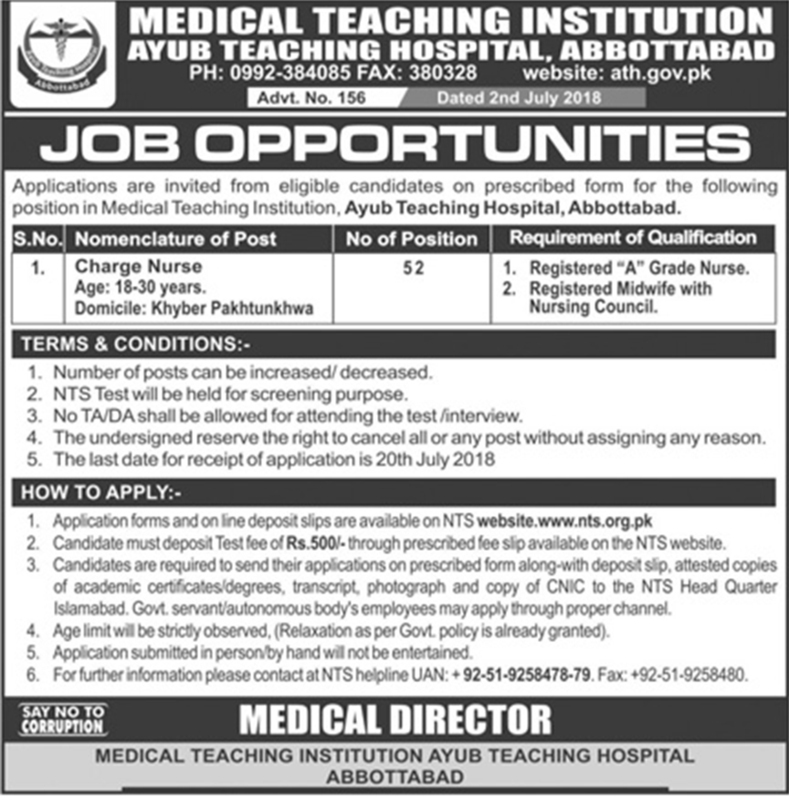 Medical Teaching Institution Ayub Teaching Hospital Abbottabad Jobs Via NTS has been announce. Last date to apply is Friday 20th July, 2018. 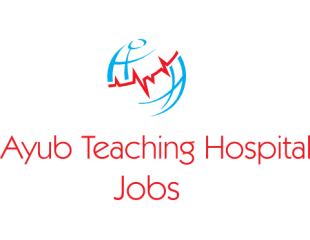 Download application form for Charge nurse jobs from here. Ayub Medical and Teaching Institution ATH Abbottabad, a 1000-bedded tertiary care teaching hospital. It is the largest health carefacility of the Northern Pakistan. Established in 1998. ATH has one of the largest trauma centres. Ayub Teaching Hospital ATH employs more than 500 in-house physicians including 60 residents (fellows) and also 200 nurses. Around about 3500 members of staff working at ATH Medical Teaching Institution Ayub Teaching Hospital Abbottabad. Application are inviting from the eligible candidates on prescribed form for the jobs in Abbottabad Ayub Teaching Hospital. All those candidates who have domicile of KPK Khyber Pakhtunkhwa are eligible to apply. 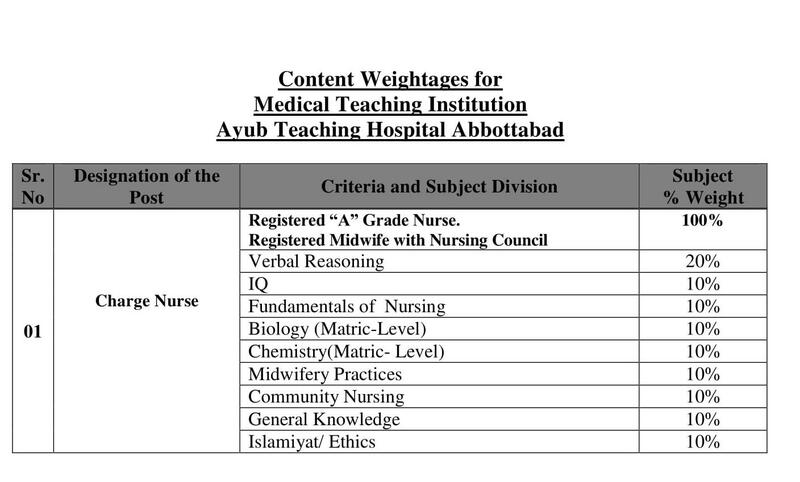 Last date for application submission is Friday 20th July, 2018.Terms & conditions as well as other requirements for Medical Teaching Institution Ayub Teaching Hospital Abbottabad Jobs Via NTS are mention below. Candidates can download the application form from the NTS website. Application form is also available here. NTS test fee which is Rs 500/- can be pay in any branch of HBL, UBL, MCB, or ABL. Candidates shall submit duly filled Application form, along with deposit slip of prescribed fee in favor of National Testing Service. Attested copy of CNIC, educational and experience testimonials, recent passport size photograph. Incomplete applications or applications received after due date will not be entertain. Age limit will be strictly observed. Age relaxation will be given according to Government rules. Government/ Semi Government employers apply through proper channel. By hand submission of application will not be entertain. Department has the right to accept/ reject or cancel any application or recruitment process.